Lathyrus odoratus - From 1887, these unusual heirlooms feature various coloured blooms that are striped on a white or cream background. 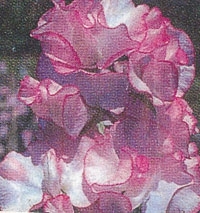 A flower with a mystique exhaulted to almost angelic proportions is the heavenly sweet pea. The gardener�s love affair with the Sweet Pea goes back to 1699 to the cool, mountainous pastures of Sicily where it was �discovered� by an Italian monk. Seed was sent to a Dr. Uvedale, a gardener and physician in England who grew it under glass. Its heady fragrance made it most desirable and after the development of several new colours and an increase in bloom size, it was much sought after cut flower gracing the finest of tables. In the language of flowers, the sweet pea means adieu or departure.